Shoot and Sell | Can I create my own custom sizes? Can I create my own custom sizes? 18 Jul Can I create my own custom sizes? Yes of course! The app comes pre-loaded with all the common image sizes some of which are checked off by default, others that you can add by going to the gear icon and choose “customize image sizes” and check on more. 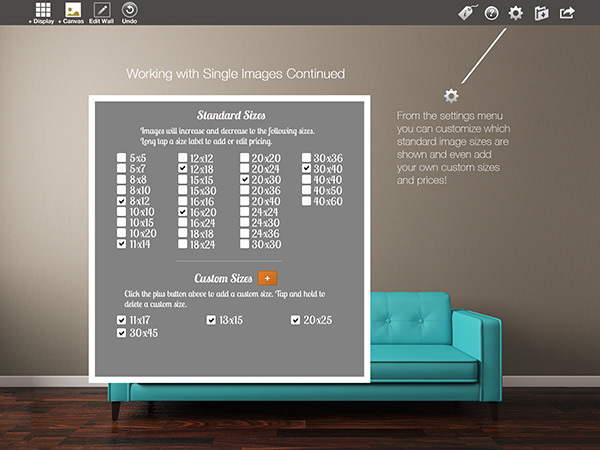 The app will only increase or decrease to those checked off sizes when you use the spread and pinch gesture to change the size of the image on the wall.